Because of the chasm caused by the missing 1890 census, I had lost track of Henry & Marion (Sanford) Brown (my 2nd great grandparents). Henry and Marion lived in Selene, Michigan in 1882, when Ada was born but nothing else. Certainly Marion was alive in 1884 when she gave birth to their youngest child, Edward in Dakota Territory. But I couldn’t find any direct evidence of Henry after the 1880 census, although I sort of assumed that Edward was his child. If Henry made it to Dakota Territory or if Marion was there alone with some of her other family members, Sanfords, in the Dakota Territory was still a question. Ancestry.Com has a database, North Dakota, Compiled Census Index, 1870-1890, which I thought would help. The index should be just the thing I needed to figure out what happened to Henry and Marion. It is a “collection contains the following indexes: 1870 Federal Census Index; 1885 Federal Census Index; 1890 Veterans Schedules.” Nothing. Lots of other Browns but nothing showing my Henry, Marion, or their kids and particularly Edward who was born there. Being an index, there is nothing to browse, so I figured maybe the index pages exist elsewhere. Which told me that besides Ancestry.Com there is somewhere else (Misc.) that has an index. 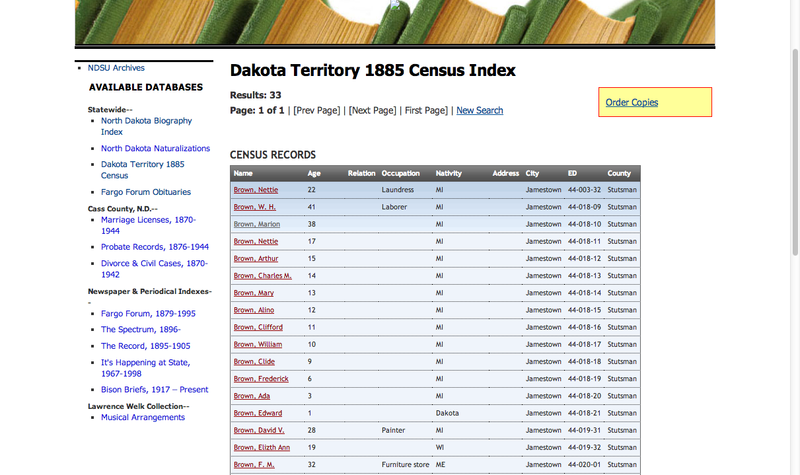 Click that link and I was at the Library, North Dakota State University and their Search the Dakota Territory 1885 Census Index page. A search for Henry Brown, yielded 17 Henry’s but not a one from Michigan. Next, a search for Marion Brown. There she was, right name, right age, right place of birth. It sure looked like her. Clicking on her name brings you to the Census Records Page she is on. Sure enough there she is apparently with her husband “W. H. Brown”, and her 11 children. Henry was a laborer and the family lived in Jamestown, Dakota Territory, in 1885. So the whole family did make it to North Dakota. I went back to the Ancestry.Com and searched again. No Browns in Stutsman county; none in Wells County nor Kidder County either. I think that there is a problem with the database on Ancestry. It should either have all the counties or identify that database is incomplete. I submitted feedback to Ancestry that the database was incomplete. I’ll report here if I hear anything back. The 1885 Territorial census gave me new information. Henry Brown was also known as “W. H. Brown” – a clue that may help me find him in other places. The whole family did move to Dakota Territory sometime between 1880 and 1884. In 1885 they lived in Jamestown, Stutsman County, North Dakota. I know the family is spread out over North Dakota, Minnesota, and Montana in 1900.